This section covers adding images to your page and several methods for controlling the flow of text around images. Images are inserted using the img element. The most common formats for images are GIF, JPEG, and PNG. The src attribute specifies the image's location on either the local file system or the Web, and the alt attribute specifies a text string that should be displayed if the browser cannot load the image. Here are some ideas to consider when using images. To make the image appear on its own line, use a p or br element before the img element. For large images, make a smaller version (i.e., a thumbnail) to decrease the time needed to load the image. The alt attribute is required by HTML and XHTML. The value for alt is also commonly displayed as a tooltip when the user hovers the mouse over the image for a few seconds. A similar attribute, title, also exists that most browsers use to generate a tooltip. To prevent the display of a tooltip (e.g., images used for bullet points in an unordered list), use title="" and alt="". The width and height attributes control an image's dimensions. When these attributes are specified, the browser can construct the page more quickly because it can render the page and download the image in parallel. Otherwise, the browser must first download the image to determine its dimensions and then render the remainder of the page. The width and height attributes can also be used to scale an image. For example, if the image is 400×310 pixels and you want to display it half-sized, specify width="200" and height="155". Percentages can be used; however, the values are relative to the browser window, not the image itself. Scaling the image by adjusting the width or height does not change the image size. In other words, the browser still has to download the full image, even if that image is being displayed with smaller dimensions. If you want the page to load quickly, a better solution is to make a separate, smaller image to use as a thumbnail. If the user wants to see the entire image, the user can then click on the thumbnail image. 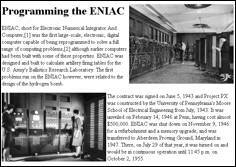 As an example, the following markup code links a thumbnail image, eniac_thumb.jpg, to the full-sized image, eniac.jpg. The align attribute can make an image float along one side of the page, with text and other elements wrapping around the other side. NOTE: This attribute is deprecated because style sheets are more commonly used to control image layout. The markup and sample output below demonstrate left floating. Different images can have different float types. The key is to place each img element directly before the text that it should disrupt. The markup and sample output below demonstrate left and right floating. A floated image affects all the elements that follow it, unless a br element with the clear attribute is used. To force the text to follow the image use <br clear="all" />. If you have several consecutive images, some of which are left-aligned and some of which are right-aligned, you may want text to follow the left-aligned images but flow around the right-aligned images. In this case you would use <br clear="left" />. Alternatively, if text should flow around the left-aligned images and follow right-aligned images you would use <br clear="right" />. Any text after the img element but prior to these br elements will still flow around the image. 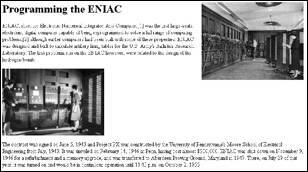 The bottom-left image fills in some of the whitespace under the first paragraph. In particular, part of the bottom left picture and the first two lines of the second paragraph flow around the right picture. To prevent this, you can put a line break after the first paragraph indicating that succeeding text and/or images should follow the right picture. The red line in the resulting output below shows how the bottom of the first image is flush with the top of the second image. To have the second image, which is aligned on the left margin, display before the next paragraph, you can place a line break after that image. You can add spacing between images and text by using the img element's vspace and hspace attributes. The values of these attributes are the number of pixels to use as spacing. NOTE: These attributes are also deprecated in favor of style sheets, which allow greater control over the spacing around images. It is not necessary to specify both the hspace and vspace attributes. The disadvantage of using these deprecated attributes is that the same amount of space is added to the top/bottom (vspace) or left/right margins (hspace) of the image. Style sheets allow you to control the spacing assigned to each margin. The following example puts 40 pixels of vertical space and 20 pixels horizontal space around the first image, and then puts 30 pixels of horizontal space around the second image. NOTE: The blue boxes indicate the spacing. absbottom: Align the bottom of this image with the bottom of the largest text item on this line. absmiddle: Align the middle of this image with the middle of the largest text item on this line. bottom: Align the bottom of this image with the baseline of the text. middle: Align the middle of this image with the baseline of the text. texttop: Align this image with the tallest text in the line. May behave exactly like top in some browsers. top: Align this image with the theoretical tallest text element in the line. The markup and sample output below demonstrate the use of each of the image alignment types.